"This wonderful comfort soup is a balance of lemon, salt, heat, and savory herbs. Serve it on a cold day. Can be made vegan, vegetarian, or with chicken easily." Heat olive oil in a large heavy-bottomed pot over medium heat. Cook and stir onion, celery, and carrots until slightly tender, about 5 minutes. Add garlic; cook and stir until fragrant, 30 seconds. Add water, lentils, 2 tablespoons fresh parsley, salt, coriander, cumin, black pepper, and cayenne pepper; stir to incorporate. Cover and simmer until lentils are tender, stirring occasionally, 1 1/2 hours. Whisk butter and flour together in a small saucepan over medium-low heat; stir constantly until thickened and paste-like, about 10 minutes. Reduce heat to low, stirring every 2 to 3 minutes, until light brown, about 20 more minutes. Whisk flour paste into finished soup, a spoonful at a time, until smooth and creamy. Serve with lemon wedges, 2 tablespoons parsley, and a sprinkle of freshly ground pepper. 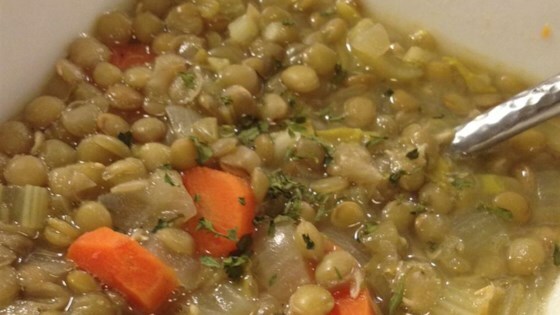 See how to make a traditional Lebanese lemony lentil soup. This soup is absolutely exquisite!!! I made it for my family last night and not a single drop was left in the pot. It is hearty and very very rich! It was very bland.It was very bland, sorry.